Today marks the day that I have to be out of my old place. So weird that two years have already flown by. It has been fun. It has been an adventure. But, I am exited to be moving on to a new neighborhood…Powderhorn was great and all, just not me long term. On that note, I should probably get back to helping my friends move my stuff…I have the greatest friends! How do you feel about moving? Any big moves coming up for you? How often do you move? Tonight will be filled with moving my closet…going to take awhile. That will also include singing at the top of my lungs. Own it, my loves, even if you don’t know all the words – sing with passion! What are your Friday night plans? Are you one to sing aloud with no shame or do you prefer to keep to yourself? I love this shot so much. I love the all black and then pop of neon pumps. Perfect summer time chic. A fun printed skirt is perfect for adding some fun of the summer to to office. I love these peacocks so much. I love this mirror so much. Maybe an option for the new house?! It is at least serving some inspiration…it is beautiful! A touch of lavender always makes something more lovely. What are you doing to love and enjoy this last week of June and first full week of summer? It is summertime. It is hot. Yet, we are all still adults having full time jobs. Thus, we are faced with a challenge. How do we bring the summertime heat and laid back style to the professional setting that is our daily job?! I have found flowy pieces do wonders. Adding in fun bright prints is great. And when I am needing a classic, adding a fun bright pump to a classic black look gives it that summertime feel. Not feeling like dressing up?! Throw on a maxi and top it off with a blazer…has done the trick many a times for me on a Thursday morning when I am already in the weekend mindset…plus, you also need something that transitions to a rooftop patio happy hour…right?! How do you incorporate summertime fun into your business professional look? A good mashup is always fun to jam out to. I especially am loving this one Kimbra recorded of “Two Weeks” by Grizzly Bear and “Head Over Heels” by Tears for Fears for Triple J’s Like a Version program. It is so well done. She also just released her album. She creates such a fun sound…I am loving her. What are some of you favorite mashups? More and more you are finding people that love their state. There has always been the love of Texas for the Texans, but state pride is no longer just for those down south. There are fun ways to show your state pride. In South Carolina they put the Palmeto Tree on everything – even their flip flops. I have a good friend from Washington who sports her state around her neck in a simple delicate necklace. And then there are people like me and my good friend, Martha, who show off our state pride permanently. By getting inked. 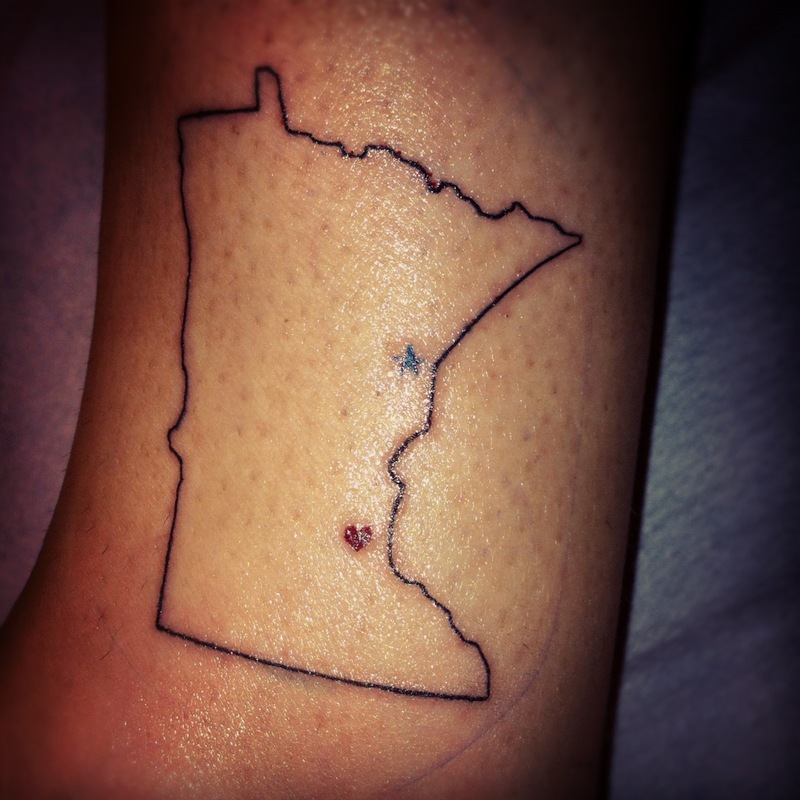 That is right, while I was in Colorado I added my newest tattoo to the collection – the lovely state of Minnesota that I love so much and now it will be with me where I am go in the world. Do you have a love for your state? What do you love about your state? Would you ever get a state tattoo? What state holds your love? Okay, not a real screen saver as when your computer goes to sleep, but rather it is a metaphor. Stop for a moment, what is your default thought you find yourself going to? Often times it can be that new relationship or wanting to be a new relationship, or that new piece you are dreaming to have to add to your wardrobe, or like me currently…a new house. That’s right my loves, it looks like the big move (goal of 2012) is becoming more and more of a reality by being a big move across town to a new house. My very own house. Problem is, I am still in the house hunting stage, which I did a lot of last night, and now it is all I can think about and talk about. I think if I send one more house or dream living room to my coworkers they may scream – they can only see so many before they go – alright, lady, just buy one already! But really, they are excited for me, they just wish I would take the plunge already. It has been so fun to look and dream of what could be. Also, it is funny to see that what I am drawn to in my personal style is what I am drawn to in my interior design plans…black, white and greys anyone?! Or is this just a fashionista problem?! What is your current “screen saver,” if you will? Do you own your home? Glad you do or do you feel stuck? I’m finding putting down roots is somewhat scary, but an exciting scary. I’ve called Minneapolis home for a few years now, and now I am ready to really make it home because I do LOVE this city. I seriously cannot get enough of chambray. I am loving that this trend continues to pick up steam. So much, that it is even finding ways into being a great option to wear to the office. It is a perfect way of bringing in the laid back ease of summer to the office. I also love my chambray shirt to throw on over any sun dress when it starts to cool down at night. It is the perfect amount of warmth. Are you all about the chambray craze? How do you style your chambray? That is right my loves…I am off today and loving every moment of it. I am off to go explore the world of the mountains and breweries and frolic with other nature loving free spirits, much like myself!